Groundwater is a key environmental compartment that may be affected by shale gas exploration and appraisal projects which are currently underway in Poland. The key issues focus on water requirements and potential contamination risks at drilling and stimulation (hydraulic fracturing) stages. Oil and gas exploration and production operations give rise to a number of questions on groundwater use and protection capabilities. Most of them are answered in this section. Groundwater quality protection during gas exploration and production operations. well abandonment and site reclamation. 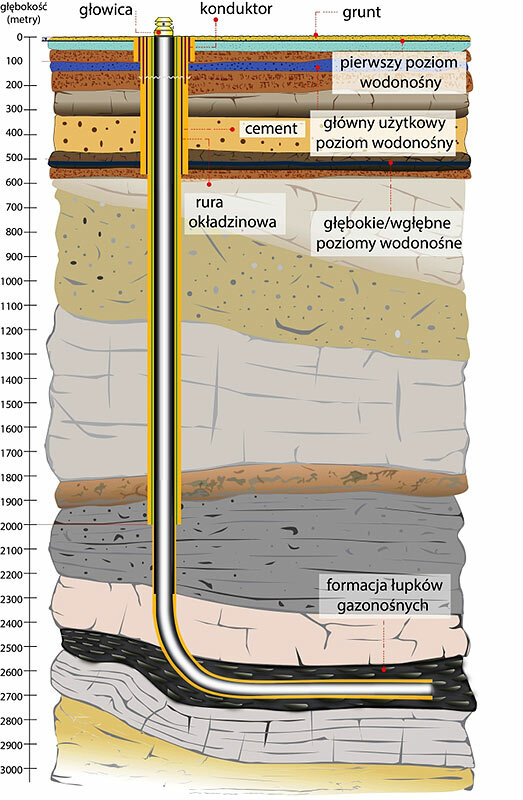 Gas-bearing shales occur In Poland at depths ranging from 3 to 5 km, in areas of different geology and hydrogeological conditions. The maximum depth of freshwater aquifer occurrence in Poland is estimated at approx. 300 m below the ground surface. The depth may vary, depending on both regional and local factors. 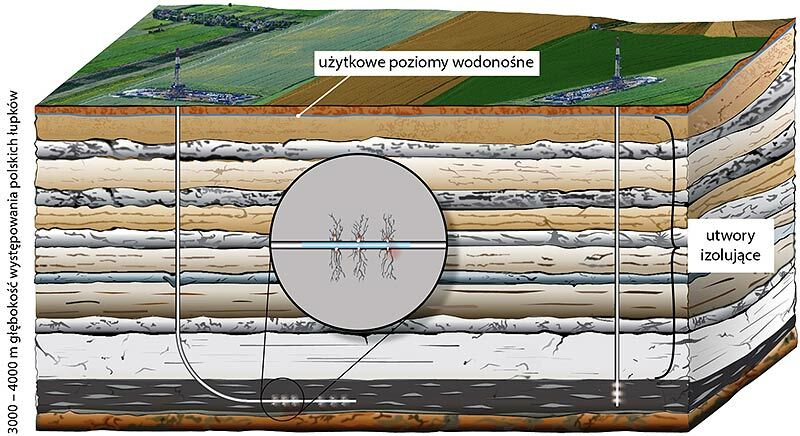 Fore example, in northeast Poland aquifers occur at depths ranging from 200 to 300 m below the ground, whilst in southeast Poland (Lublin and Zamośc) the depth does not exceed 160 m below the ground. Moreover, mineral and thermal waters occur in the existing shale gas exploration areas. The depths to mineral waters range from 200 m below the ground (near Torun) to over 500 m below the ground level (for example north and northeast of Lublin). Thermal waters occur at a depth of approx. 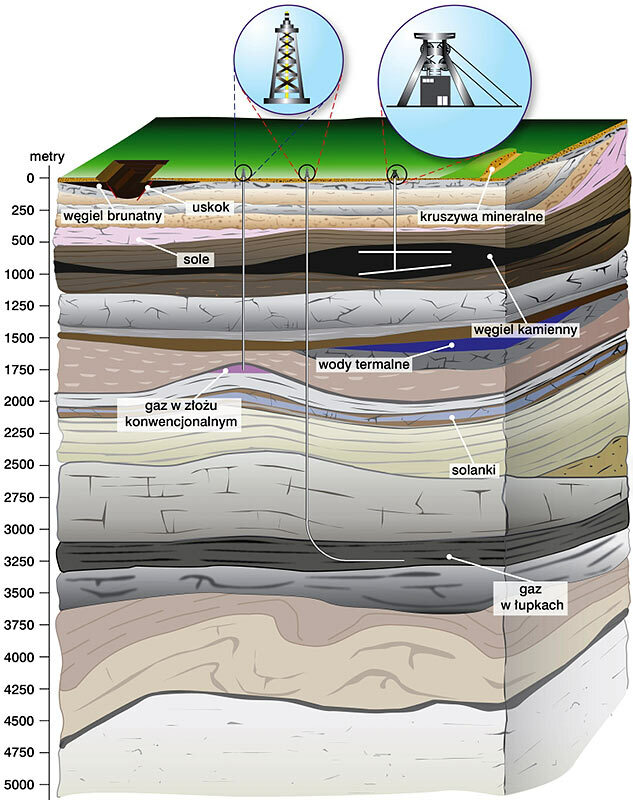 2500 m below the ground level (Hydrogeologia regionalna Polski, vol. II, PGI, 2007). Due to the depth of gas-bearing shale occurrence, drilling wells have to pass through local aquifers that frequently are the only source of water supply to the local residents. emergency events (e.g. a drilling rig failure and related drilling fluid spills). permanent supervision by competent District Mining Office and environmental compliance inspections by national authorities (PIOŚ, WIOŚ, GIOŚ, RDOŚ). 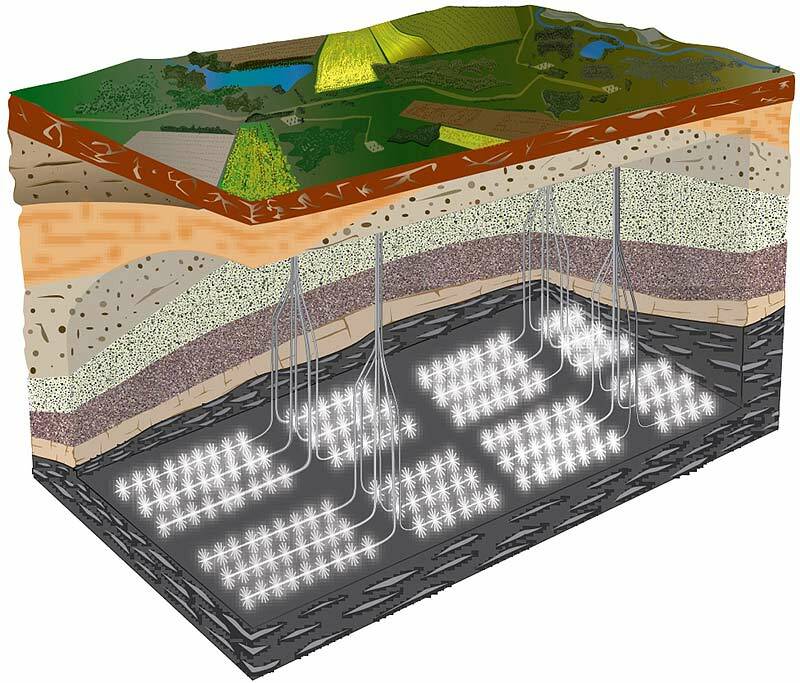 The depth to gas-bearing shale rocks helps to eliminate the risk of groundwater contamination. A thick overburden of impervious rocks isolates freshwater aquifers that occur at depths of up to 300 m from the ground level (Fig. 3). Hydraulic fracturing is a technical procedure which establishes a network of induced fractures in the shale formation. Interconnected fractures form a path of gas migration to the borehole and then to the surface. Normally, the range of hydraulically induced fractures is approx. 100 m from the borehole. Fracturing (Fig. 4) involves sequential injections of a highly pressurized process fluid (the so-called fracturing fluid) with proppant (filling medium) into horizontal leg of the well. The fracturing fluid is composed of water (approx. 99.5%) with chemical additives (that are intended to make the fluid slick, reduce its viscosity and prevent the swelling of hydrophilic clay minerals), bactericides and gelling agents to prevent proppant buildup at the well bottom. other emergencies (e.g. process fluid spills from defective equipment). Gas may be produced for several decades from several tens of horizontal wells drilled out from a single site. sealing with impervious sheets and concrete slabs the ground in immediate proximity of the well, as well as by appropriate drainage system for conveying stormwater out of the site. Well abandonment and site reclamation is the final stage when gas production is discontinued. Its purpose is to restore the original intended use of the site area. emissions of reservoir gas and groundwater contamination with gas. permanent monitoring of well tightness throughout the well abandonment operations. Exceptionally, well leakage and migration of reservoir gas to aquifers and the ground surface may occur following well abandonment. In that case the investor should prepare a recovery plan and cooperate with competent authority so as to minimize environmental impacts and restore integrity of the abandoned well.